EDITORS NOTE: Hello there readers! It’s been a while since the last interview so I couldn’t be happier to be back and speaking with the two creative minds behind, Up to 4 Players, a weekly web comic that tells the story of a group of friends playing an RPG together. We’ll be covering what makes this so special in the interview but seriously, go check it out, you won’t be disappointed. Also, they’ve created a roleplaying game based on the Crystal Heart comic strip, on Kickstarter from November 20th so click the link to find out more. Hello Aviv and Eran, thanks for taking the time to speak to us. Firstly, could you tell us a little bit about yourselves? Aviv: Hi Ross! Thank you for having us on, even though we don't technically do art in board games. I am a freelance illustrator, specialising in character art and comics. My passion for drawing started with the animated X-Men series from the 90s (of course I created my own super-hero group that was almost, but not quite, EXACTLY like the X-Men), so action, fantasy, and colourful, bigger-than-life characters have always been my cup of super-powered tea. Later, thanks to Eran, I got into the amazing hobby of roleplaying games, and that has become a major inspiration too. I've lived in Israel most of my life, and thanks to the internet I was able to expand my knowledge, skills, and social network, especially around those hobbies that were (and still are, although to a lesser extent) somewhat fringe in our small country. I moved to London 5 years ago because I've always LOVED this city, and I'm so happy to find it's just as lovely to live in as it is to visit and watch on screen. Eran: Heyo, I'm Eran, and I'm definitely the writer, because when I do art, people cry. I've been a roleplayer ever since I discovered the D&D Red Box around 1990, and it quickly became a passion, then a career. I've worked as a game translator, a professional game master for social skill development, gaming store owner, and probably a few other things, all with "game" in the title. Like Aviv, I'm from Israel originally but I moved to London around 2012 following my wife's career - she has a PhD in English literature, specialising in "London and the Fantastic". Yeah! I love nothing more than to explore new worlds, even though I'm usually the game master, which means my players get to do most of the exploration. Aviv and I share a love for high-action, light-hearted fun, and so we got to create a few octane-fulled narratives over the years, trying out various approaches and concepts. ﻿Tell us more about Up to 4 Players! What inspired you to start it and what have been some of the highlights for you so far? We had a couple of brain-storm meetings, thinking about the structure of the comic and the main characters, and we decided to combine jokes about board games - a hobby we both share - and anecdotes about Israelis moving to London - which we both are. It was great fun to do a steady 3-panel (more or less...) comic together again, but after almost 150 strips we wanted to try some longer-form storytelling, and talk about our even bigger mutual hobby - roleplaying games. Thus Crystal Heart was born. Eran: Since Aviv covered the history, I'll cover some of the highlights. Several of our strips got some global attention, thanks to being shared by the likes of Blizzard's Heroes of the Storm, Fantasy Flight Games, Czech Games Edition, and others. That was always exciting, watching the next-day figures in our analytics, but most of the time, they didn't translate to tens of hundreds of new followers - most people enjoy what they enjoy, and have no interest in next week's joke, which will be about some other game. Discovering that despite this we have a large enough fan base to allow us to open and maintain a successful Patreon page, THAT was awesome. We have nothing but respect to the people that seem to have respect for us, and I think that's a good relationship between creator and consumer. The next step was having a table at UK conventions, which is what we've been doing for the past year, and also definitely going to continue doing in the foreseeable future. I have to say the illustrations in your webcomic are absolutely gorgeous, where did the look and feel come from and how has this developed over time? Aviv: Thank you! A huge inspiration on my style back when I did V-Squared - and still today - was the webcomic Penny Arcade. I've always loved Mike Krahulik's character designs, extreme expressions and smooth line work, and it's been a highlight in my career when I recently got to work with Penny Arcade on Thornwatch! In Crystal Heart there is also a lot of inspiration from animated shows like Gravity Falls and Steven Universe: I am awed by how much atmosphere and personality they create with very simple, minimalist lines and beautifully balanced colours, both in characters and in environments. And always in my art there are Disney influences, because I spent my childhood mesmerised by all the old and new classics. Eran: Aviv mentioned a lot of cartoons, and for a good reason. We not only use a cartoon-inspired art style, we also have cartoon-inspired character personalities, humour, and storylines. High-action, light-hearted fun! Also, in order to publish weekly instalments (first strips, now pages), the art style HAD to be simple. Even though we nowadays have a Patreon and sell some merch at conventions, we mostly use this money to pay for what we need to maintain the webcomic. Aviv is still doing this in her spare time! In regards to time, how long would you say each comic takes to produce, considering both illustrations and writing? Aviv: From the illustration side, it takes about 10 hours to produce a page (back when we did short strips it was more like 3-4 hours). I wish I could reduce it somehow, but I wouldn't want to sacrifice either the style and level of detail we established, or the "amount" of plot we manage to get into every page; since we post a new page only once a week, we want each update to be worth the wait. As far as burn-out goes, I think the fact that this is a weekly webcomic helps tremendously: every week we get to hear readers' feedback and know that there are people out there who enjoy what we do. It makes it much easier to keep going, rather than if we had to draw page after page and keep them under wraps for future publication. Eran: Writing-wise, we both decide on the main plot for the current storyline, and then I start turning it into pages. I already have a feel for how much panels/pages each plot point is going to take, but it's a fluid estimation that changes as we progress into the story. Each page is pretty straightforward, taking about 45 minutes, with lots of revisions and some research (mostly into our own archive, to maintain consistency). I decide what plot and dialog we should have in every page, and then provide a general storyboard which Aviv then develops into the final layout. The work process between us includes several back-and-forths and has been tried and tested to perfection, which is insanely important in this kind of creative endeavour. ﻿Of course, I couldn't interview you without talking about Crystal Heart. Elevator pitch time, what is it and why should we be interested? Aviv: Eran, I'll let you answer that one fully because OMG I really need to get on Monday's page! Eran: Crystal Heart is our ongoing storyline, a webcomic about four players (exactly!) playing a roleplaying game. We show what's happening in the imaginary world, with all the special effects, crazy shenanigans and cool characters that should be there, but we also show what's happening around the table, between the players themselves. We want to cover the full experience of an RPG, and that means in-play action but also off-play remarks, misunderstandings, and problems that arise naturally in these kinds of games. The world of Crystal Heart is one in which people have stones for hearts, in a very literal sense. Some people can replace their heart with a Crystal, ancient artifacts from before recorded history, and thus gain superpowers! But also get a bit deranged. You see, the Crystal influences your personality, giving you strange quirks or new thought patterns. It's meant as a fun exercise for the players - remember, this is a setting for an RPG, not just "a fantasy world"; It must have RPG sensibilities. The player characters are Agents of the powerful organisation Syn, scouring the world in search of new Crystals. When we switched our webcomic style and started telling an ongoing story about roleplayers, we obviously lost some of our readership, who liked our focus on board games. However, we didn't actually lose that many people, and at the same time, we gained lots of new ones, making Crystal Heart popular enough to have us consider publishing it as an actual game you can play. So that's what we're doing! 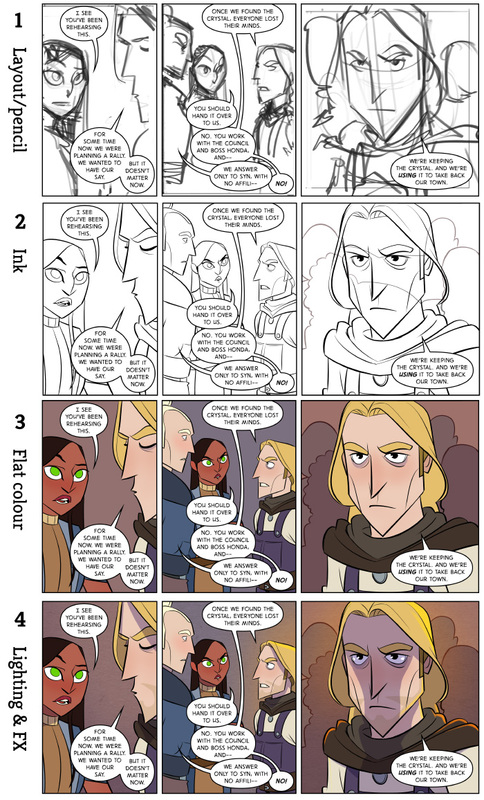 The concept of turning a webcomic about people playing an RPG into an RPG people can play is so meta. I love it. Let's talk about the game itself, when did this idea come about and in broad terms what is it? Eran: We created CH for our own gaming group, many years ago, and played several awesome sessions in it. Ever since then it remained in our hearts, pardon the pun; I actually started considered making it into a Savage Worlds setting several years before we even had the comic. There's a ton of roleplaying potential in the basic concept, of having interchangeable superpowers that also influence your personality, and also, I never got to tell the REAL STORY, the secret history that will eventually be revealed in the comics, so I was keen on finding a way to publish it in some form. Then the comic came, and now, the game follows suit. In CH you play as Agents working for the powerful organisation Syn, sent to find and retrieve the ancient Crystals that are scattered all over the continent. If this feels like the plot for an anime-inspired video game - good! In the wild, the Crystals are feral and unpredictable, creating various dangerous magical effects. Syn developed a method that allows its Agents to implant "tamed" Crystals, and turn these effects into tools and weapons. The only problem is, the Agent has to give up their own heart, and the Crystal which replaces it comes with some emotional baggage. This concept, while unique, is also pretty straightforward, which is very important to us - we wanted the comic to be approachable and we want the game to be accessible, which is why we've released a free Starter Set with most everything one needs to play. ﻿You've chosen to power the world of Crystal Heart with the Savage World ruleset. Why is this ruleset special and what makes it the perfect fit for your RPG? Eran: Savage Worlds is advertised as being Fast, Furious Fun, and it really is. That's the kind of comic we wanted to have, full of quick actions and pulp-inspired twists and turns. SW works very well with unusual settings - it has about a dozen official settings, all of them weird in some way! Also, and that's super important, it's an easy system to explain and understand - you just roll a die and need to get a 4 - because we had to explain the rules as we were telling the story. It's a story about people playing a game, so the game is one of the main characters. Originally we were thinking of using a more narrative-based system, like Fate, or a Powered by the Apocalypse game. These systems help the players create an awesome story simply through the process of being played. After some consideration though, we realise that WE are the ones that need to have control of the story, not the rules - what works around the table doesn't necessarily work for stories being told ABOUT what's going on around the table. We also have only good things to say about the owners of Savage Worlds, the people at Pinnacle Entertainment Group, who support their community (and us) very well. The webcomic has built a rich narrative story, so what were some of the most important things you wanted to bring across into this game? Eran: Oh, what a question! Most of the things we now bring into the game were established during the first few months of the comic, because Nadav, the game master, had to make some decisions when creating the campaign he's running (that is, we had to make these decisions, so that his game will be realistic). So, for example, the fact everyone is working for a powerful, mysterious organisation is a big deal both in the comic and in the actual game. We've replaced money with Requisition, meaning that if you want something, Syn will provide it, but you need to prove yourself (raise your Req points!). We created a reputation table, to help game masters decide on how people react to the player characters; it's called Everyone Has an Opinion About Syn. We add rules for special teamwork, training, rival Agents, Syn facilities, and more. The second important aspect we import from the comic is the themes. Each Crystal has a theme, each Land has a theme, campaigns should have a theme. Themes help keep a tight narrative, they guide you toward a specific path and keep you from wandering off, and that's a powerful tool in any improv environment and especially roleplaying games. We explain all the themes and also give some guidelines and rules as to how to use them. Finally, we wanted to bring the colourfulness of the comic, both literally - the book is going to be very colourful, I mean, just look at the cover art - and figuratively, by having rich, diverse populations. The entry for each Land, for example, focuses on what makes it different from the others. Everyone has politicians, sure, but in what way are Bogovian politicians different from Zingamaian? (the former lie to the public, the latter poison their enemies). We'll also have characters from many colours of the rainbow, many genders and races and whatnot. It might seem like a game about Crystals, but it's actually a game about people; and there sure are a LOT of kinds of people in the world, so we'll have them in the game as well. A big part of the world you've built is shown through the art. How does the game continue that and what differences are there if any? Aviv: We plan for the book to have A LOT of art in it. Probably more than the average Savage Worlds setting book, because as you said - that's a big part of the world. The main difference to what we've been doing so far is that it's not going to be sequential art, but individual illustrations that support and illuminate the lore, mechanics, and world building; so I am free to invest more time and energy in design, concepts and making every bit of this world as awesome as possible, because I don't have to worry about re-drawing these things for the next 30 comics pages! In terms of style, I think we've established a pretty strong artistic language through the comic and several other pieces of content we've created for our patrons (some of which would become available during the Kickstarter), so I don't see it change much for the setting book. It's also fairly unique in the world of RPG art, which I'm quite happy about! ﻿Your Kickstarter for Crystal Heart launched on November 20th, so finally for anyone still on the fence why should they back? Aviv: For those who enjoy Savage Worlds for its pulpy, fast, furious and fun adventures, I think Crystal Heart does all of that with a nice shiny crystalline gleam! It's a setting full of colour where so many settings nowadays go for the dark and gritty. There's plenty of drama and darkness to be found in Crystal Heart for sure, but you can also play it super lighthearted and fun (I have recently GMed a short one-shot where everyone ended up dancing to the beat of a disco-ball Crystal in the middle of a jungle). For people who haven't played Savage Worlds, it's a fun, fairly simple system to learn (we actually explain the basic rules to it in a 2-page comic), and it's just finished very successfully Kickstarting its newest edition, so it's a good jumping-on point. 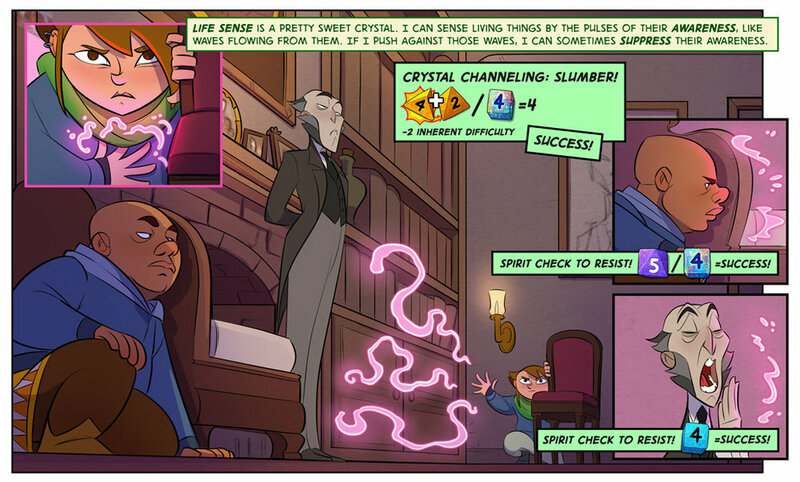 And Crystal Heart is one of the first settings that will be be available for the new edition, so - join Syn, exchange your heart for a superpowered Crystal, and get adventurin'! Click here to find the Crystal Heart RPG Kickstarter!